Prepare butter. Mix parsley & garlic powder into room temperature, softened butter. Spoon into heart molds & let set in the fridge for a few hours until firm. Thaw shrimp in cold water bath. Drain. Place shrimp in the Ziploc bag. Add the olive oil, lemon juice, garlic salt & pepper to the bag. Zip the bag and combine all with your fingers. Place the bag in a bowl (so it does not leak) and let shrimp marinate in the fridge for 1-2 hours. Remove shrimp from the fridge & thread 4 onto each soaked skewer. Coat a grill pan with some olive oil & heat on medium high heat. Place shrimp skewers flat in the pan. Heat a few minutes on each side until you have grill marks & the shrimp is pink, opaque & cooked through. Remove butter hearts from the molds. 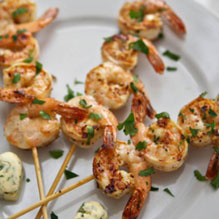 Serve shrimp skewers hot with the butter hearts.